Agartala: A large portion of Tripura has boiled for past two days over the participation of opposition political parties and ruling partner of BJP in civic by-poll, which put a big question mark for the sustenance of the BJP-IPFT coalition government in the state. 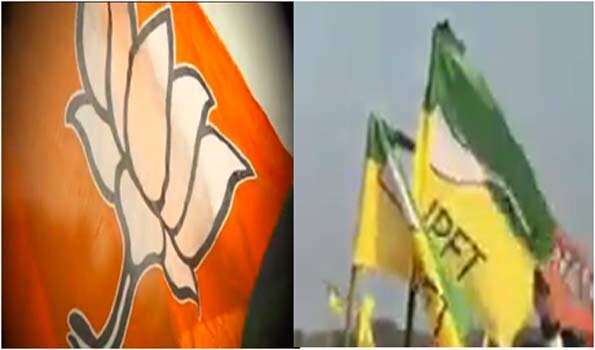 According to report, the clash between BJP and IPFT workers have been escalated further last night in several places of North Tripura, Dhalai district, Khowai district, West Tripura and Gomati district. As many as 47 people including a Tripura Police Service officer and three other policemen were injured in the violence in Dhalai district. A 20 years old tribal youth identified as Takhirai Debbarma was beaten to death by an irate mob in Tulasikhar block of Khowai yesterday following death of another youth by a tripper lorry of which Takhirai was assistant. Though the violence started after the road accident, later it took political shape and IPFT workers had got involved into it. The accident had triggered high-voltage tension as the irate local people chased the driver and assistant of the lorry into a nearby TSR camp. In the camp itself the driver and his assistant were hunted down and severely beaten up along with another person and the camp was also set on fire. The IPFT workers blockade the road at Gandacherra and Taidu protesting against manhandling of their MLA of Rimavalley Dhananjoy Tripura allegedly by BJP workers in Durga Chowmuhani block when they had gone for filing nomination of civic by-poll. However, BJP denied the allegation and stated that unruly IPFT cadres attacked BJP supporters and policemen. As a result, SDPO Kamalpur Shankar Das, OC Manik Debnath and two others were injured. The movement of vehicles on district roads and sub-divisions was disrupted since afternoon. A few hundred passengers coming to Agartala from Kamalpur, Khowai and Taidu were stranded till late night. Later, police somehow managed to evacuate them to the safer place. No transport to Khowai,Kamalpur,Kailashahar,Ambassa, Gandacherra is plying on the road. The BJP MLA from Suryamaninagar of Agartala, Ram Prasad Paul was accused of leading the violence in Dukli block on the Congress workers when they went to submit a nomination. Allegedly, Paul assaulted Congress leaders and abused police. Three policemen were injured on the spot by BJP workers that led to shelling tear gas and resort to lathi-charge for defusing tension. The police registered a complaint against Paul for instigating violence and obstructing police in action. However, Paul denied the allegation and claimed that Congress workers became unruly on BJP cadres and police were attacked by opposition workers. Top leaders of both the parties held separate meetings over the situation and Chief Minister and Deputy Chief Minister reviewed the situation till late night. Police was asked to be firmed in action against the violators. The IPFT leaders had a meeting till late night and reviewed the situation. "We requested our workers to calm down and maintain peace. The problem started with the selection of Chairman of BACs four months ago. Before it was addressed, by-poll to Panchayats were announced and there was a common understanding that BJP and IPFT will share the seats considering their strength in the localities though it was not formally agreed to. But when we have seen BJP is fielding their candidates in all the places and our claims were turned down, IPFT fielded out candidates that a section of BJP leaders cannot accept," said IPFT Vice President Ananta Debbarma, who was also injured in violence in Jubarajnagar of North Tripura. He stated that the agreement of the coalition between BJP and IPFT was not implemented properly in a single case. Moreover, the economic condition of the state was not improved and aspiration of the common people was frustrated in last six months. All CPI (M) cadres were given priority by the new government and none of the poll commitment was fulfilled so far that irked the ground level supporters of BJP and IPFT, Debbarma stated. "The chaos is outburst of frustration at the lower rank of the parties and crisis of leadership in BJP," Debbarma said, adding that despite all odds IPFT is trying to improve the situation and appealed the government to understand the public sentiment and do accordingly. On the other, BJP General Secretary Pratima Bhowmik said, "We feel whatever incidents were happened in the state so far was the evil. design of the opposition to bad name the coalition government what CPI (M) had done in 1988. Might be some supporters of IPFT were motivated and trapped to trigger the violence but we confident situation will be normal soon." Meanwhile, opposition Congress and CPI (M) demanded to defer the civic by-poll and extend the time of nominations, as ruling party did not allow them to file the nomination. They also demanded to ensure the security of contesting candidates and restore poll friendly environment. BJP's minister says "No dilution of SC/ST Act"